As an adult I have never felt vulnerable, always up for a challenge, and feeling emotionally strong, even during the most challenging of times. But in hindsight I realise that it was because I always assumed that my body would be able to stand up to the rigours of life. Since cancer, it has become incredibly weak, and every little thing can become a medical emergency. Doing small jobs around the house is difficult, as I have little strength or movement now, and even getting in and out of the car has to be a carefully planned manoeuvre! Mentally I am still strong and maybe stronger since my experience, but overall I would class myself as feeling vulnerable. 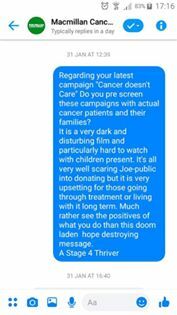 I ask this question because I have become uneasy with the increase of emotionally disturbing advertising I am seeing from the large cancer charities. Adverts telling us that one charity is there for us whatever we need. Another promising that they will cure cancer sooner, with our donations. Many others offering free will writing services, which for me is one of the worst things that I see. Encouraging people who may well be dying of this terrible disease, to leave money to them! If I am honest, I don’t believe that this is morally correct. Of course people don’t have to use that service, or even leave money to the charity. Other will say that it encouraged them to at least get their affairs in order, which of course is a positive thing. The facts are that for many charities, legacy can be the largest chunk of their income. I run a charity, and I know how tough getting donations can be, I also talk to many very vulnerable people, who barely have enough money to put food on the table, and are also at the end of life. I wonder how they view this new style of advertising? “We support you physically, financially and emotionally,” so says the latest advert from Macmillan Cancer Support. I’m sure there are many people that would agree with this statement, but it is a very bold one! I am working with patients daily, and this is not the general service received. How can they support everyone in this country affected by cancer? Of course they can’t but it doesn’t look like it from their latest advert. Brilliant marketing I must agree, but misleading in my opinion. 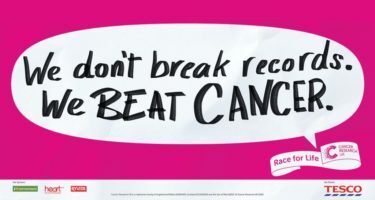 Cancer Research UK also come in for criticism for their advertising, focussing heavily on will writing and featuring children frequently always good for pressing the emotional buttons. The issue that I see here is that once one of the big boys moves, everyone else has to, with a fear of being left behind in the never ending quest for donations. Meaning more and more of their income gets spent on television advertising and general marketing. The advertising companies love the cancer world, as they push our boundaries even further. It feels like I am part of a target audience, there to lap up their latest offerings. I have spoken to these organisations about their lack of sensitivity towards people affected by cancer, but they both hide behind the excuse of increasing awareness of the services they offer! Of course we need to talk about these issues, and we have certainly come a long way in the last twenty years, but are we now going too far? When I look on their social media platforms, I read as many complaints as compliments. But the same replies are given out to every complaint, no human interest at all. Are they even bothered about criticism from the people they are supposed to be helping? I find little humility from their senior management, only interested in statistics, targets and income! Yes, we are all a target for these people. As the numbers of us increase, so does their captive audience, new people joining every day. I don’t believe they are interested in treating us as vulnerable people, just as an ever increasing fundraising audience. Bombarding us with emotionally charged advertising that shows us how they can help all of us with everything cancer has to throw at us. I personally believe that this is incredibly CYNICAL, MISLEADING and offering FALSE HOPE to many, who actually believe what they are shown on the television. Then as soon as we receive our diagnosis we are bombarded with advertising about making a will and leaving these organisations money in it. Of course we all need to ensure we make a will, but the last thing I wanted to hear after my diagnosis was a begging advert from a charity who has never spoken to me during my life other than to ask for money! Of course us charities need money to function, but I believe that the current advertising is very misleading and has no consideration for families affected by cancer. Asking someone you have never met for money in their will just doesn’t sit well with me. Here is the video I refer to in my piece. I appreciate there will be many points to be raised on this subject, and as always these are mine. Please feel free to join the discussion below! I agree totally Deb, and this seems to be the reaction I hear from most people. Yet despite seeing large numbers of complaints on their social media channels, it makes no difference. They certainly don’t listen and have no humility at the top of the organisation. Anything to make a quick buck! I always hate the adverts especially on TV if I want to give I will not be told how much each month. I agree with your thoughts Chris. Chris, you are so right. I was literally hounded by a cancer charity who wanted to film me saying I would be leaving them money in my will. When you are a cancer patient you need practical help not future promises for others, laudable though that may be. After I recover then I will think about helping in the future, but now that is why I like to support charities like yours, that reaches out to offer practical support when I need it. Unfortunately these organisations are so brazen and without shame Verite! I get very angry whenever I see this style of advertising, putting emotional pressure on people who are already vulnerable! Despicable in my book! Wow – that Cancer doesn’t Care ad Hadn’t seen it. It’s awful. We have also received gifts from people who have passed, but thanking us for the work we have done! I am a dreadful fundraiser Caroline but could not get involved with advertising like this. I believe it is a disgrace to all of us affected by cancer, and in many ways fraudulent. Well done Chris … I firmly believe that large cancer charities are cashing in on the hopeful patients and families. CEO’s and.manu employees of these Charities are enjoying lavish salaries and lifestyles funded by … Yes Fundraisers. Fundraise for the little local charities who do amazing cancer support work!!!! And managed on a shoestring. There are a lot of fab charities in this sector, doing great work Caroline. Everyone must be paid of course, but money not spent on making outrageous promises to mislead the public! Can they support everyone? Are we closer to curing #cancer? This is so true @christheeagle1 and I’d love to meet you and discuss what we can maybe do to change some things for the better. The one thing I would like to see stopped immediately is the advertising of cancer charities offering Free Will writing linking it to saving lives?? NO this is not right, it needs to stop! Some of the tv adverts are disturbing and frightening, especially for young children. What we say as people living with cancer needs to count. What sort of research was carried out before these adverts went live? I wanted to put my views out there Cheryl. I feel sick when I see these charity giants chasing people affected by #cancer to leave money in their will by making false promises. As a charity owner I am embarrassed by this behaviour. It’s wrong! First question the @macmillancancer representative asked me when I was in hospital, having been given my diagnosis only minutes before: did I have a will? Then gave me a leaflet about will writing. That entire industry is an utter disgrace and makes me cringe. I also turn off the radio adverts too!! Beverley I think that reason why there is advertising stressing ‘fear of cancer’ is because we need to be frightened of the way NHS seems to slip further and further down the survival statistics in comparison with other countries. My local Cancer Alliance has just spend a fortune on conference venue, meals for over 150 attendies (all provided by NHS) on a conference that regurgitated the same old stuff from 10 years ago. Until NHS actually bans these money-wasting exercises, there won’t be any will to improve what we are offered – just lazy admin staff hitting the ‘re-send’ button on their lap tops. Good luck to Chris – what he says needs to be said, and the NHS needs to sack those who don’t bother to sort out the mess that is our cancer care.